Zoot Scoot: And don't let the door hit you on the way out. There's something inherently repulsive about a band whose claim to fame is a cheeky revival of a sleazy revival (twice-baked or refried?) of a co-opted, white-washed musical tradition. The "original" songs that Big Bad Voodoo Daddy cranked out last Saturday at the Catalyst are not so much recycled waste as they are simply sterilized and dumbed-down plays on their vital forebears from the '20s. Except it was less hot and more Vegas sleaze. And then there were the zoot suits--didn't they see the movie? Like any trashy revival, BBVD is helping to reduce a once-potent cultural symbol to a kitschy fashion statement. But as a welcome counterpoint to the disgusting sucking sound that refried beans make as a congealed mass of them plops out of a can, BBVD actually put on a decent show. Lead singer/guitarist Scotty Morris' vocals were as technically unremarkable and stylistically boring as ever, but the rest of the band sounded pretty damn good. Good enough for the swing dancers anyway, who were out en masse to dance the night away with one of the pivotal bands behind the whole '90s swing revival. 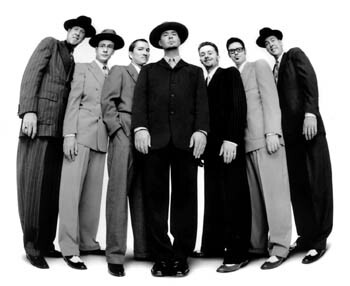 Granted, BBVD never scored a big crossover hit like the Squirrel Nut Zippers' "Hot" or the Cherry Poppin' Daddies' "Zoot Suit Riot," but their reputation as mainstays in the L.A. lounge/swing scene scored them a cameo in Swingers and an appearance at Superbowl XXXIII, neither of which hurt the band's already sizeable following. Neither did crossover stabs like "I Wanna Be Like You," a swinging, Latin-infused cover of Disney's Jungle Book anthem, and their hoppin' alcoholic single "You & Me & the Bottle Makes 3 Tonight." They did well to play original favorites like "King of Swing," "She's Gone" and "You Know You Wrong," and did a nice job covering Cab Calloway's call and response classic, "Minnie the Moocher." Their most impressive effort was a cover of Blue Lu Barker's "'Don't You Feel My Leg," a racy little ode to the prudish vamp that they pulled seemingly from nowhere. But then, pulling from roughly the same region, they busted out with Nirvana's "Smells Like Teen Spirit," which just reeked of one of those drunken, "wouldn't it be cool if ..." ideas that should have been promptly aborted the morning after it was conceived. Whoa! Maybe Ashcroft made 'em do it! Sick of It All, The Unseen, Avenged Sevenfold, Glasseater, and Western Waste perform at the Vets Hall on Sunday, Oct. 12. Visit www.numbskullshows.com for more information. From the October 8-15, 2003 issue of Metro Santa Cruz.